All was well in the long run; Cambridge is not short of taxis, and we had our study unloaded and set up long before the first Fresher came through the doors of Kelsey Kerridge. Over the next two days a team of 15 librarians from across University and college libraries smiled at students, handed out flyers, and told everyone who would listen about the new Library Gateway. They cheerfully made time during the busiest week of the entire academic year, shouted themselves hoarse over the din, and scarcely got to sit on the “sofa” (two stacking chairs cunningly decked out with the aforementioned cushions and throw) because they were so busy enticing prospective library users (“Access the library from your bed!” was one of my favourite lines). 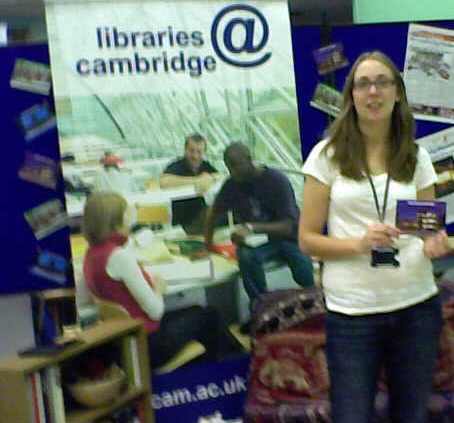 Being at Freshers’ Fair was a first for Cambridge Libraries, not merely in that it was the first time libraries had had a presence there: it was also our first outing as a joined-up library service, under the banner of libraries@cambridge. Along with the Library Gateway and the promotional film The Perfect Desk, the Freshers’ Fair stall was the outcome of a grass-roots movement towards greater communication and collaboration amongst all the individual – and autonomous – libraries across the University. Our stall, the banner, and, er, the taxi fare were paid for by the University Library, but the idea, the planning and all the work was done freely and joyously by Cambridge librarians who contributed their time, creativity and expertise. And this time we didn’t even need the stimulus of caffeine. By the next day we were down to 600 flyers, my colleague had recovered from his norovirus, and Sarah had created a Flickr stream of all the other stallholders whom she’d inveigled into showing off our postcards!